Rising Damp is the slow, upward movement of water from the ground, through the connecting pours of bricks and mortar, by capillary action. In severe cases, it can continue to rise to a height of 1.5 metres. If damp has been diagnosed by a building surveyor, or you are experiencing problems, with the property you are living in or let to a tenant, it is very important to deal with it quickly, before secondary problems, such as mould, damage to plaster or wood rotting fungus occurs. A Damp property is unhealthy for all of us but especially for young children or older people, who suffer from respiratory problems. It is also unsightly, can lead to timber decay and expensive heat loss. When damp rises from the ground, it carries with it hygroscopic salts, which are deposited in the masonry and wall plaster. 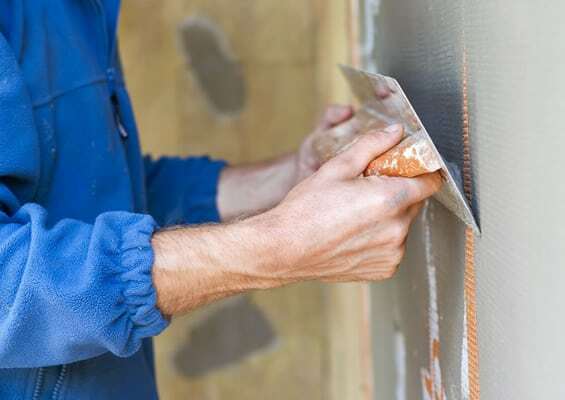 On humid days, these absorb moisture from the atmosphere, so the wall will always remain wet, until the contaminated wall plaster is removed and replaced with a damp proof plastering system. 1) The existing damp-proof course is being bridged by higher external ground levels. 2) Bridging of the existing damp proof course, by a higher, adjoining concrete floor. 3) A breakdown of the existing damp proof course, due to age or natural movement of the property. 4) The property is built prior to 1875 before damp proof courses became mandatory. Tapco HomeDry damp surveyors are fully qualified to the high standards of the PCA (Property Care Association) and have many years of remedial treatment experience, with both domestic and commercial properties. This ensures they will assess and correctly diagnose the extent and cause any damp, prior to submitting specific recommendations for long-term, guaranteed protection of your property. What is lateral damp penetration? Lateral damp penetration is when damp penetrates though a wall, from a higher external ground (earth retaining) or a higher adjoining concrete floor. This type of damp can cause walls to be very wet and often does more rapid and serious internal damage than rising damp. 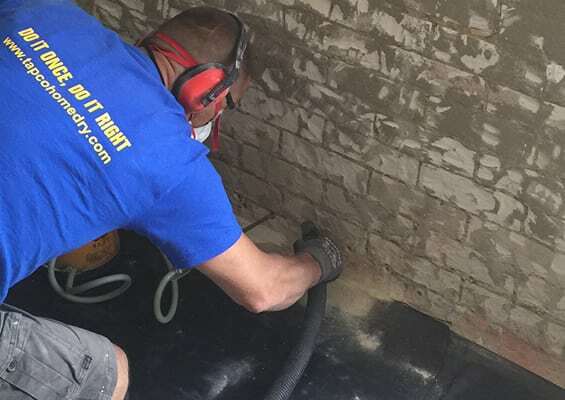 This is often found in older London or suburban properties, which were built with basements, semi-basements or cellars that were not adequately protected against damp when they were constructed. Water from below the ground is forced through the wall by hydrostatic pressure, progressively causing considerable damage, until the room is no longer habitable. How do you stop lateral damp penetration? Conventional damp proofing will not stop lateral damp penetration and in most cases far more radical measures are required. Tapco HomeDry are specialist at structural water proofing, commonly known as Tanking. Our fully experienced technicians, prepare the walls, create a floor/wall joint and apply a gauged scratch coat of water proof rendering. Slurry coats of cementitious structural water proofing are then applied, allowing each one to cure, before applying the next. Further damp proof rendering and plastering is then carried out, all of which blocks damp from penetrating. Alternatively, in some situations, our surveyor may recommend the installation of a Cavity Drain Membrane. This is a high-density Polyethylene, studded membranes, which are fixed to the walls, using water proof ancillary plugs and tape, which can by plastered directly onto or dry-lined. A complete CDM system can create a new warm, dry favourite room, for many years to come. Call or email us to book a damp investigation appointment. Our survey will locate where and what is causing the damp and what measures are required to eradicate it. All work is carried out by our experienced technicians to the high standards of the PCA.